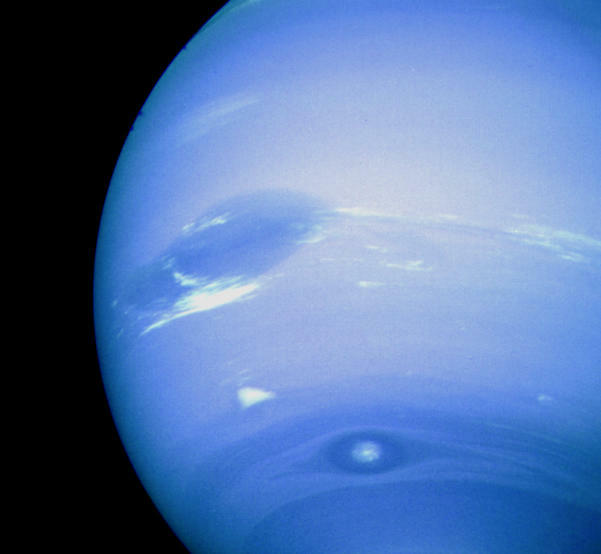 Explanation: Neptune has spots. The Solar System's outermost gas giant shows a nearly uniform blue hue created by small amounts of methane drifting in a thick atmosphere of nearly colorless hydrogen and helium. Dark spots do appear, however, that are anti-cyclones: large high-pressure systems that swirl in Neptune's cold cloud tops. Two dark spots are visible in the above picture taken by the robot Voyager 2 spacecraft in 1989: an Earth-sized Great Dark Spot located on the far left, and Dark Spot 2 located near bottom. A bright cloud dubbed Scooter accompanies the Great Dark Spot. Recent computer simulations indicate that scooters are methane clouds that might commonly be found near dark spots. 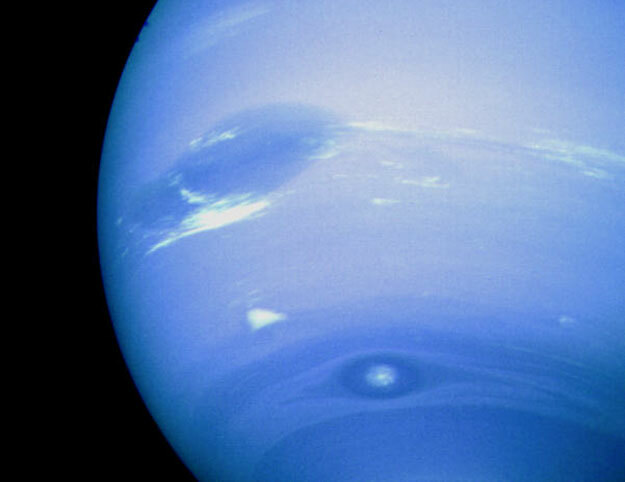 Subsequent images of Neptune by the Hubble Space Telescope in 1994 indicated that both of these dark spots had dissipated, but another had been created.